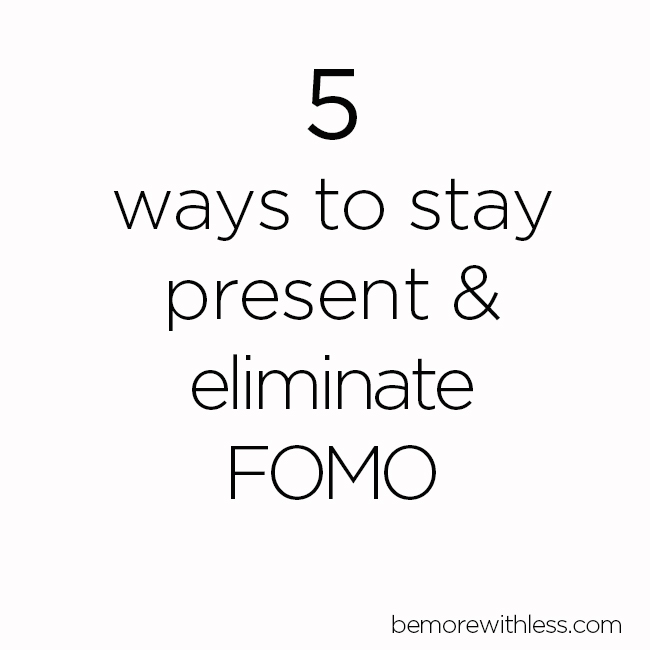 FOMO is the acronym for the fear of missing out and it isn’t just a hip new saying. It’s real. We are struggling with the fear of missing out on activities, information, opportunities, connection, and many other things. We struggle to keep up, to catch up, to be included, noticed and loved, all in the name of FOMO. The only remedy for FOMO is to be present. When you are truly present, there is no regret for the past, or fear of the future. When you are present, you notice everything and everyone around you; the big picture, the little pictures, and all the tiny details that contribute to the moments which make up the here and now … which make up your life. And that’s just what happens on the outside. Your body, heart and soul change on the inside too when you give yourself permission to be fully alive and aware. That’s presence. You might expect meditation to be one of the 5 ways to stay present and eliminate FOMO, but it’s not. I have a meditation practice and I recommend meditating, but it’s not the only way or even the most powerful way to stay present. It’s great when you can stay present during a meditation session, but if you can’t bring that peace into the rest of your day, it’s probably not a good practice in being present. How do you stay peacefully present in a crazy world? FOMO signals a lack of engagement. If you are worried about what you are missing, you cannot be present. Letting go of FOMO means abandoning the need to catch up, keep up, and measure up in exchange for a chance to connect and engage with what or who is right in front of you. 1. Stop acting like everything is an emergency. If you are living and/or working in a reactionary state, or under stressful conditions, you might be used to treating everything like an emergency. It’s not. Instead, choose to under-react, respond thoughtfully, leave the drama and stress out of it. The simple act of giving yourself room to breathe will bring you into the present. From there you can make your decisions based on fact, not fear. We say we keep our devices on in case someone needs to reach us or incase there is an emergency. And then we make everything an emergency. (see #1) When our minds are on our phone notifications, and the anticipation of new information coming across our devices, we simply cannot be present. We are scattered, distracted, and completely unaware of what matters now. It’s then that we ignore the people we love most, make crappy decisions, and feel stress when we should feel peace. Find a way to make your devices add value to your life by setting limits. Experiment. Erin broke up with her phone. Jake created a distraction-free iPhone. Set limits and create your own experiment. Instead of “checking” all day long, scheduled two intentional sessions with your digital device a day. The distraction of a check in is not nearly as damaging as the time lost trying to come back to what you were doing. It takes more time than you think to be present again. When you were a little kid and went out to play, you didn’t worry about tomorrow or yesterday. You didn’t care how you looked, or what people thought of you. Instead you jumped in the puddles, rolled down the hill, and laughed until you cried. If you want to be present, fold up your to-do list and go play. Take a walk, sing a song, paint a picture, hike up a mountain, or go jump in a puddle. Play your way. 5. Choose deep vs. wide. 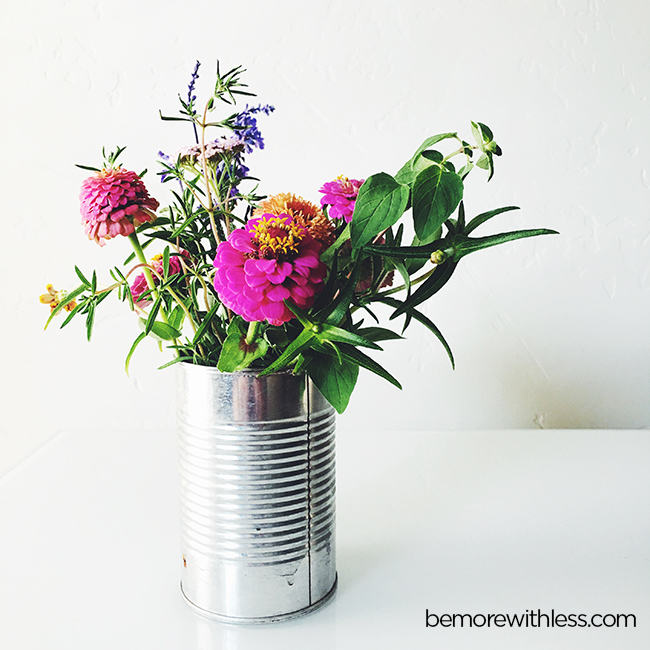 Would you rather have just a taste of 100 things on your bucket list to say you accomplished them, or the opportunity to savor a few? Give into FOMO, go wide, and take a taste. Have a little bit of everything. Or, choose a deep meaningful dive into something you care about. Choose a life-changing experience. Choose true love. Choose magic. Be more with less. Experiment with these recommendations to stay present in your life and turn your FOMO into JOMO: the joy of missing out. Feel joy that you have a choice, joy that you are protecting what matters most, and joy because you are present, because you are finally living. I love your suggestions but I may have a problem with “Play”. If didn’t care how I looked, what people thought of me and Instead jumped in puddles, rolled down hills and laughed until I cried, I would end up in a mental institution. Just Kidding. LOL. The suggestion I like the most is to choose deep vs. wide. I have been living this suggestion for a few years now and enjoy it’s results. Suggestion #1 was a thought provoking one for me, as I tend to sometimes treat ordinary events as if they are emergency’s, without realizing it. Awhile ago I became familiar with the Derek Sivers’ approach referenced on another blog…good advice as well. I love all these suggestions, especially to focus on one thing deeply instead of several things shallowly (kind of like how multi tasking doesn’t actually work) but I’ve been struggling with one thing lately pertaining to being present in the moment–how can we both be present in the moment and yet plan for the future? I loved this post and it is something I needed to read. I’ve been trying to practice more minimalism in my daily life but lately my old habits keep creeping in. It’s so important to remind ourselves that not everything is an emergency. I also need to get back in the habit of turning off my devices after a certain time at night. This is so impactful to me right now and I feel inspired and more confident to make better choices for myself. I recently have been experiencing a case of FOMO and I realise how dangerous it is for me. Specifically for my mental health, because my mind easily wanders into the dangerous waters of self-doubt and self-loathing. Thank you for this inspiring post. It’s also been on my heart to be more present, and that is definitely what I am going to do! I am totally over over scheduling my kids summer break! Hell yeah! I love that. Great, great post!!!!! How’d you get to be so wise, Courtney? Another post I want to save. I’m staying with my daughter’s family right now, and find my two little grandsons really help me to spend time in the moment, and to play! This resonated with me. I find myself continually agreeing to attend work happy hours throughout the week that lead to eating bad food, drinking unhealthy beverages, and incessant negative talk. I’m afraid if I say no I will stop getting invited. This stopped me in my tracks and made me take a hard look of what I’m ACTUALLY missing out on by always saying yes. Thank you so much for the reminder! A friend used to say that in everyday life, “things that are important are rarely urgent, and things that are urgent are rarely important. Childbirth excepted.” We so often equate urgent with emergency. What a stressor! Under react. Yes. Thank you.